A simple and enjoyable Fruit Slot game from Gaming Realm is now ready to be discovered at Vegas Spins. 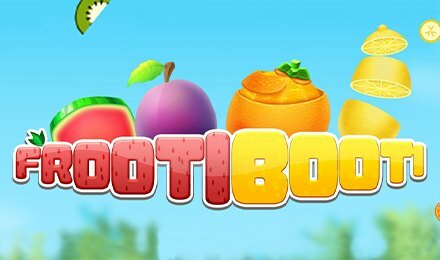 Time to get the fruit basket ready and head out for a picnic in Frooti Booti Slot! This minimalistic style and easy on the eyes game, comes with just 5 reels and 20 paylines of fun. The game’s design and gameplay will suit players who prefer games to be simplified with just the basic features. Interesting enough, the game does have free spins, and the wilds in the game can double the wins! The background seems to be set in a meadow with a fruit crate and napkin for a nice picnic outdoors. On the reels there are star fruits, cherries, melons, plums, oranges, and lemons as higher symbols. The lower symbols include Kiwi A, Strawberry K, Citus Q, Banana J, and apple 10. To enjoy this fruity game, sign up at Vegas Spins for an account. If you are already a member, then you can log into the game directly and play. The next step is to adjust your stakes on the screen. You will find that you can adjust the stakes on the right side of the screen. Click the STAKE icon and a box will appear with all the coin values from £0.20 to £50.00. Choose your bets and, click the spin icon to start the game. Bet Levels: There are no bet levels in Frooti Booti Slot. Amount of Paylines Selection: The game has 20 paylines. Coin Values: The minimum value is £0.20, and the maximum value is £50.00 respectively. A pair of cherries represent the Wild in this game. They can replace any other fruit, number and alphabet symbols within the game by forming winning combinations. They can also double the wins for payouts. However, they cannot replace the star fruit scatters on the reels. The Scatters in the game are represented by a Star Fruit Bonus Symbol. They can land anywhere on the reels, and they cannot be replaced by a Wild. If you pick up 3 of these symbols, you unlock the Win Spin Bonus. 16 Win spins and 2x multiplier with all wins. 4 Win spins and 8x multiplier with all wins. 8 Win spins and 4x multiplier with all wins.